Today’s audio-visual (A/V) receivers are, at their heart, seriously high-performance multimedia computers. These monsters integrate beefy digital signal processors (DSPs) in order to decode, encode, and transport multiple streams of audio and video. The real problem facing the manufacturers of A/V receivers is the target environment: Your living room or home theater. The variety of TVs, CD players, DVD and Blu-ray players—even VCRs, turntables, and a host of other gear—forces A/V receiver designs to become switching engines with massive numbers of connectors on the front and back. On top of all this, most manuals are terribly written, full of obtuse jargon and offering little useful assistance. It’s impossible to cover the entirety of possible connections your living room entertainment center or home theater might support. What I’ll do instead is show you one example of a (somewhat) high end A/V receiver, its suite of connectors, and the purpose of the connectors. Since so many different connectors exist, this will be somewhat brief—but should get you started. The receiver shown here is an Onkyo TX-NR809, a 7.2-channel model. It’s less than two years old, and most of the connectors are current, including support for HDMI 1.4a, which supports 3D video and ARC (audio return channel.) But we’re not focusing on internal features, rather the connections to the outside world. This particular Onkyo receiver hides its front panel connectors under a flip down door, along with a plethora of additional setup and control buttons. Headphones. This particular port is for wired headphones with 1/4-inch plugs, but you can use an adapter for headphones with 1/8-inch plugs as well. Front USB. Most modern receivers now support digital music players. Some have direct support for Apple’s iPod and iPhones, including navigation controls. You can usually plug in a USB flash memory stick with music or video, and the receiver will automatically recognize the content as media files. Note that not all receivers support the same file formats, however. Front HDMI input. Yes, that’s right—this is an HDMI input port, not output. You can directly connect your camcorder, digital camera, or other HDMI-equipped digital device, to easily show off your photos or video. Additonal auxiliary inputs. You may have older devices that only support analog output. You can connect composite video and stereo audio here cables. Should your device have TosLink optical digital audio output, you can use that instead of analog stereo. Some receivers may also support S-Video and component video auxiliary inputs on the front. Calibration microphone. Modern, multichannel A/V receivers live in complex environments. 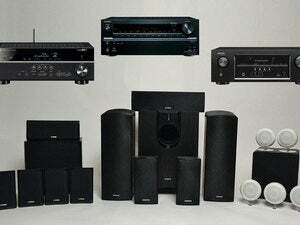 Getting surround-sound audio—particularly bass—to sound right in most parts of the room is a daunting task. Today’s receivers have automated calibration capabilities, and ship with a calibration microphone. You only connect the calibration microphone when you’re calibrating the sound to your room. As clean as the front of most receivers tend to be, the back panel connectors of a typical receiver can seem overwhelming. It’s unlikely you’ll use all of them, however. In my case, most of the analog connections go unused, except for the VCR connections—I use my VCR maybe once a year—and the connections for the Wii game console. Digital audio inputs. If you’re attaching an old-school CD or DVD player that probably lacks HDMI, it’s likely you’ll connect the digital audio output to one of these connectors. The RCA-style orange connectors are for coaxial digital audio. The optical connectors are for TosLink-style optical cables. Speakers. This particular receiver can handle 7.2-channel surround-sound (seven speakers and two subwoofers) or 5.2-channel surround with two channels allocated to stereo sound in a second room. These speaker terminals can be direct wired or you can connect banana plugs to your speaker wire, making speaker connections a bit easier. Ethernet. This unit supports wired ethernet. Quite a few modern A/V receivers support some flavor of network connectivity, and recent ones offer 802.11n Wi-Fi. Most of these receivers are also DLNA certified, and can work with other DLNA devices on the network. Remember that bit about modern A/V receivers being high performance multimedia computers? Well, that also includes firmware updates, which include bug fixes and occasionally new features, delivered over the Internet. HDMI inputs. At first blush, seven HDMI inputs may sound like a lot. But consider my home setup: I’ve got an Xbox 360, a Blu-ray player, a Dish network set-top box, a and home theater PC. That’s four HDMI inputs already. Having extra inputs precludes the need for an external HDMI switching box. Lower cost receivers may offer fewer inputs. HDMI outputs. If you own an HDTV, it likely has an HDMI input. HDMI switching is one of the coolest aspects of A/V receivers. All your inputs go into the receiver, Audio and video processing magic happens, then the result is sent to your HDTV via HDMI. ARC stands for audio return channel. If your HDTV has a built-in tuner, ARC allows you to route the audio from your HDTV so it can be processed and heard through your fully calibrated, 7.2 channel speaker setup. Component video. High end, pre-HDMI components often supported component video. Video quality over analog component connections can be pretty good—you can get up to 1080i HD video—and it’s difficult to justify tossing out a perfectly good plasma TV that lacks HDMI. This receiver offers two sets of component video inputs and one output set. Preamp connectors. If you’re using your receiver as a glorified control unit for an even bigger, more capable amplifier, you’d connect that amplifier via the preamp connectors. In other words, you bypass your receiver’s amplifier section and use the receiver just as a preamp/tuner. Most people won’t use these connectors, with one notable exception: This is how most dedicated subwoofers are connected, via one or both subwoofer pre-out connectors. Multichannel analog audio outputs. Back in the day, certain formats like SACD and DVD-Audio didn’t work over digital audio connections like TosLink or coax cables, mostly because of paranoid content providers. Instead, you’d connect a whole bunch of RCA cables from your player to your receiver if you wanted multichannel audio. HDMI now has built-in content protection, and is fully digital, so you won’t need these unless you have old players. VGA. That input labeled PC IN is a VGA connector. It’s useful for quick-connecting some laptops, but modern computers have DisplayPort or HDMI outputs, so it’s best to use those. Antennas. If you want to hook up an FM or AM antenna, these are the connectors for that purpose. The variety of connection options is what makes most A/V receivers as large as they are, though some are big simply because they have beefy amplification sections. For most users, all you really need to know is your speaker setup and how many HDMI inputs you need. If you have some older gear (VCRs, typically), you may need an analog connection or two. Vinyl addicts will want an RIAA equalized phono input. It’s really not that difficult—but remember to label all your cables!